This post is part of an ongoing series on common logical fallacies used in conversations about race. If you have suggestions for logical fallacies that you'd like to see covered, submit your ideas here. 'Model Minority' is a term for those thought to consistently perform and behave better than other racial minority groups. In the USA, the term is closely associated with East Asians (such as Chinese, Japanese, and Koreans), as well as Indians. Though it may seem like a positive characterization, 'model minority' status is still largely detrimental, still a stereotype, and ultimately harmful. Take for example the statistics about 'median family income.' It is widely stated that the average Asian-American family makes more money than any other race in the USA. But it is important to examine these numbers in detail. As Abagond elegantly demonstrates, per capita Asian-Americans make 20% less than White Americans. And the statistic crumbles further when broken down by nationality. Hundreds of diverse Asian cultures are victims of 'model minority' collateral damage. Because the stereotype applies broadly to 'Asians,' it perpetuates the homogenization of many distinct cultures. Typically, White-Americans use the term 'Asian' in reference only to those descendants of countries belonging to the 'model minority status,' neglecting in their minds countries such as Vietnam, Malaysia, Philippines, Bangladesh, Afghanistan etc. This constant Pan-Asianism perpetuates the tendency to generalize across a broad group to the detriment of the individuals within that group. The 'model minority' stereotype, continues a long tradition of selectively attributing certain traits as individual characteristics, while allowing others to be endemic to the entire race. The perception of a 'model minority' status has lead to the invisibility of poverty and struggle within many Asian-American communities. An individual's misfortune is more likely to be seen as an anomaly of personal failing, than as a consequence of a broken system. This perception leads to under-funding of assistance programs/scholarships for a large chunk of Asian-Americans that do not fit the stereotype. Conversely, in the same way that black individual achievement is often seen as the exception to the rule, Asian-American achievement is often discredited as being a byproduct of a 'natural course.' When an individual does achieve great things, it is more likely to be brushed away and taken for granted, rather than hailed as a credit to that person's hard work and perseverance. 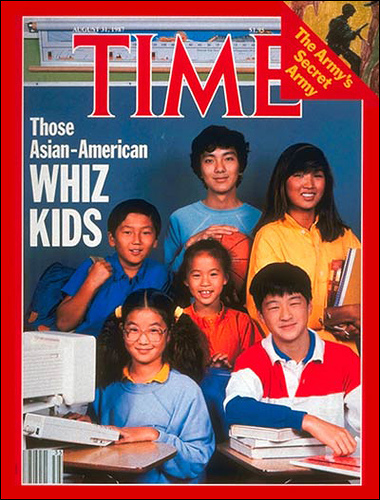 As a consequence, Asian-American school children experience significant amounts of bullying on the grounds of their 'nerdiness,' yet many also feel a pressure to live up the high standards of achievement that the stereotype sets forth. Rates of stress, depression, mental illnesses, and suicide attempts are significantly higher for Asian-Americans than for other races in the USA. Finally, it is easy to see how a 'model minority' stereotype might be just as self-perpetuating as other racial prejudices. Teachers that buy into the myth may unduly advance some students beyond what is helpful for them. Law enforcement/juries may be influenced by preconceptions of a 'complacent' culture. The myth of 'model minority' is not a benign one, much less beneficial. How have you seen the 'model minority' myth reflected in your day-to-day life? How does it manifest itself at work, at school, in the media?